Ok here goes, a Step by Step guide. 2/ Go to Properties, and then highlight the URL and Copy the URL. Anyway, Paste your URL in the box where the BLACK arrow is pointing, and Viola! You should have an Avatar! then, put [img] URL [/img] But Without spaces in between the Url and Img tags. Just to add, do not press enter between you url's for signatures as they will go down the way, instead do nothing! Your signature space on your profil page should have a part that looks like [/img][img] You can put spaces in between and writing below. Am a bit dim at this! am a child of the 20th not the 21st century! Having a grey moment Jackie?Iget lots of those these days1There are three little boxes at the end of post one says profile!Click on that.Voila! Should have siad this a while ago, but was kinda too chuffed at the time!! 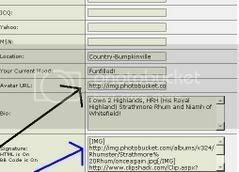 "Go to your MSN Highland Pony album" what the heck is that ? JaneIslay, If you go to the Technical Forum on the Message Boards "front page" you will find information about the albums, here is the link. You can then link from these images to the messageboard. Jill looks after the albuns so U2U her if you have queries. That is a brilliant breakdown there Scott! there you go, thanks Rebecca! I managed to put something into the signature bit - but can't seem to manage the Avatar thing - even tho it was the same url ! I got the MSM album set up ok.
CLick on U2u - another window opens and go from there - you might find one from me if I am quick! Mulletsmum - I found your email in the U2U thingy but I'm absolutely darned if I can find a way to reply ! Oh thank you Claire - I wondered how it suddenly appeared overnight ! Now I'll need to sort out the signature bits. I have tried and tried but cannot seem to reinstate my avatar. And now I can`t find the original picture either! Whose is back - yours or mine? I can see yours, just can`t see mine. Edited to add, Stompie`s pig`s gone as well! Sula and Peter Hill back!